In Eccelesiastes 1:9, King Solomon boldly proclaimed, “There is nothing new under the sun.” Yet our publishing world is always looking for the next bestseller. It's what I do as an acquisitions editor. I'm looking for a unique twist or a different combination of elements that will attract the attention of the book buying public. To be honest, this type of experimentation will often fail—but that doesn't mean we give up on innovation and continuing to try. We need to continue to write, propose, and search for such innovation. 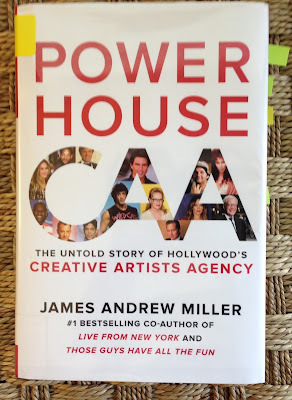 This weekend, I've been reading Power House CAA, The Untold Story of Hollywood's Creative Artist Agency by James Andrew Miller. It's a new book that I learned about reading the trades. If you get this book, you will discover it is over 750 pages (large) and retails at $32.50. When I learned about this forthcoming book several weeks ago, I searched my local library to see if they were ordering it. Nothing. I suggested the library purchase the book. When you make such a suggestion and the library decides it is a good suggestion, then you are automatically put on the hold list to get the book when available. It's how I got this book (and a strategy that you can use as well occasionally to get books). It's hard to know from the title whether a book is something you will read or not. Why am I reading through a huge book about these Hollywood agents? 1. Discover real stories about persistence and timing. In the past, I've written about how a lot of publishing is about being at the right place at the right time with the right stuff. I know there were lots of rights in the last sentence yet repeatedly I've witnessed this truth in publishing. If the “rights” don't line up, then you can't get the book published and more important than publishing—reach the right reader (i.e. sell books). It takes years and lots of money to make a Hollywood movie. Power House CAA includes a number of stories about screen plays that could not catch the right details and had been around different studios for years. With innovation, the agents at CAA put a different spin on the deal and the movie was made and became a huge classic hit. 2. Learn to pitch your material in a different way. Power House CAA gives the specifics about they formed relationships within the Hollywood community. They learned to put together packages for movies and television shows. Because they represented the different element for a movie (actors, directors, book authors, screen writers and others), the agents would pull together the elements into a single deal which they sold to the studios. Before this innovation, each party negotiated their deal separately with the movie studios. Their experiences made the agents have huge deal making and earning power in the Hollywood community. The stories encourage me to continue to look for such innovation among my colleagues and the manuscripts and proposals which come across my desk. Can you put something together that isn't normally combined and connect with the market in a new way? Can you begin to reach a new audience with that material? Maybe you reach them in person or maybe you connect with them online? Innovation is possible but will require you to open those doors of opportunity and thinking to achieve it. If I can help you in this process, let me know. As an acquisitions editor, I'm always looking and you can get my work contact information here. Have my words stirred you to innovation? Maybe they have pulled you out of the rut of rejection and despair? If so, please tell me in the comment section.